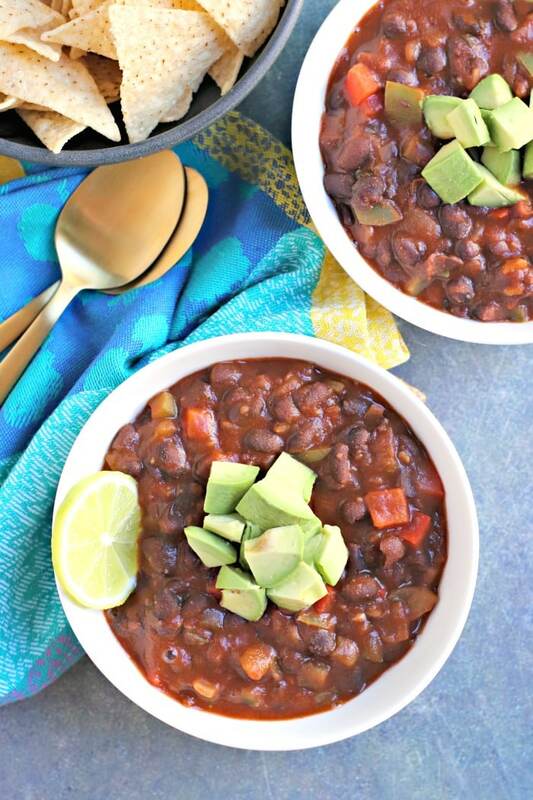 Easy Black Bean Chili is a one-pot meal that’s ready in 30 minutes. It’s full of flavor using common ingredients you may already have in your pantry. And this recipe is vegan and gluten-free. Some of my favorites are Jackfruit Chili with Fajita Veggies and Vegan Pumpkin Chili. I used to spend a lot buying Amy’s Organic Black Bean Chili whenever I saw some on the shelf at the supermarket. Then one day I realized how much less expensive it would be to make my own. And once I got in the kitchen and tested out my homemade version, I knew I had to call it Easy Black Bean Chili. Because it truly is easy. Plus it’s quick and much more economical than the store-bought version. 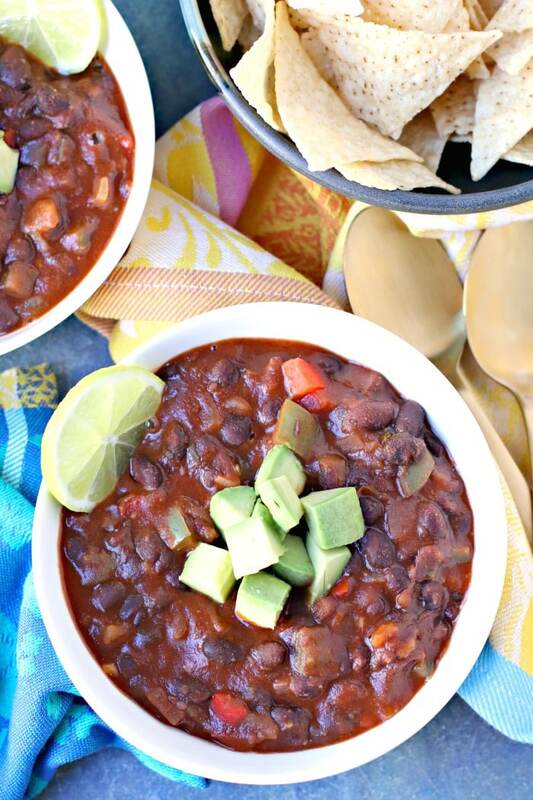 And now I’m excited to share this Easy Black Bean Chili with you! 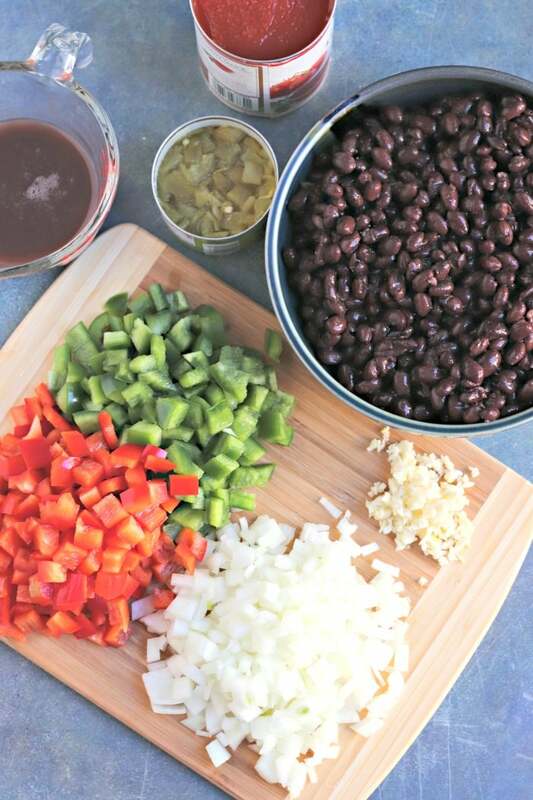 Easy Black Bean Chili starts with simple ingredients that are easy to find in any market. One legend according to the National Chili Day website is that the first chili was invented by a Spanish nun in the 1600s using chili peppers, meat, onions, and tomatoes. Whether or not this is accurate, this vegan version replaces the meat with beans. I think you’ll agree that these are all easy to find wherever you shop. Making this one-pot chili takes only 30 minutes. First I saute the onions in a little bit of olive oil. Feel free to use water if you’re following an oil-free diet. Then once the onions are soft after about 5 minutes, I add the garlic and quickly saute for about 30 seconds. Next the bell peppers join the party. After another 2 minutes or so, I add the tomato sauce, black beans (with a little reserved liquid or “aquafaba”), green chilies, cumin, chili powder, and oregano. I personally like to use Mexican oregano, but whatever kind you have on hand will work. Then I stir everything together and let the chili simmer for 10 minutes until heated through. Finally I add a squeeze of lime juice and a little salt. 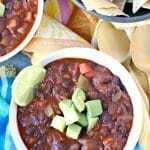 Serve Easy Black Bean Chili with your favorite toppings. I love topping my chili with diced avocado and eating it with some tortilla chips. Other options include chopped green onion and vegan cheese or sour cream. 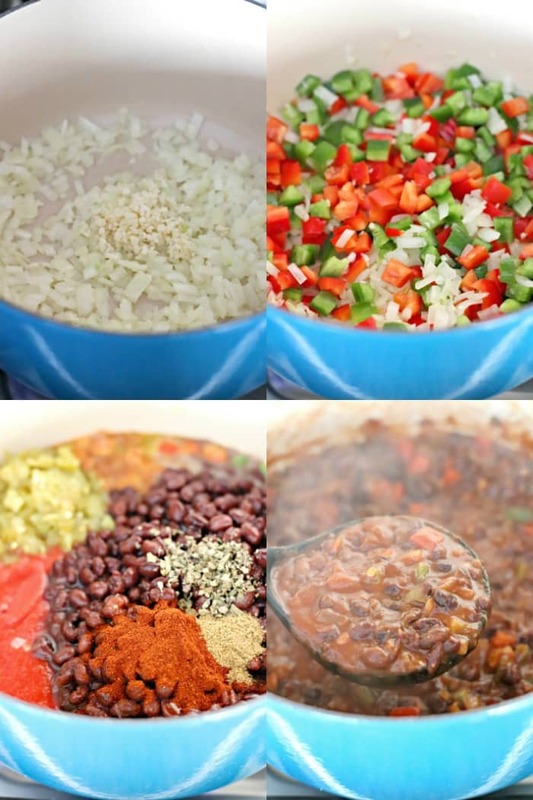 And instead of serving it in a bowl, Easy Black Bean Chili is wonderful on a baked potato or over rice or quinoa. I also like using it to make a tostada salad or nachos. What’s your favorite way to enjoy chili? 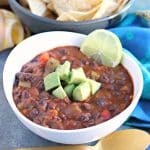 Easy Black Bean Chili is also perfect for weekend meal prep and bulk cooking. In fact, some people think the leftovers taste even better! Now let’s make Easy Black Bean Chili! 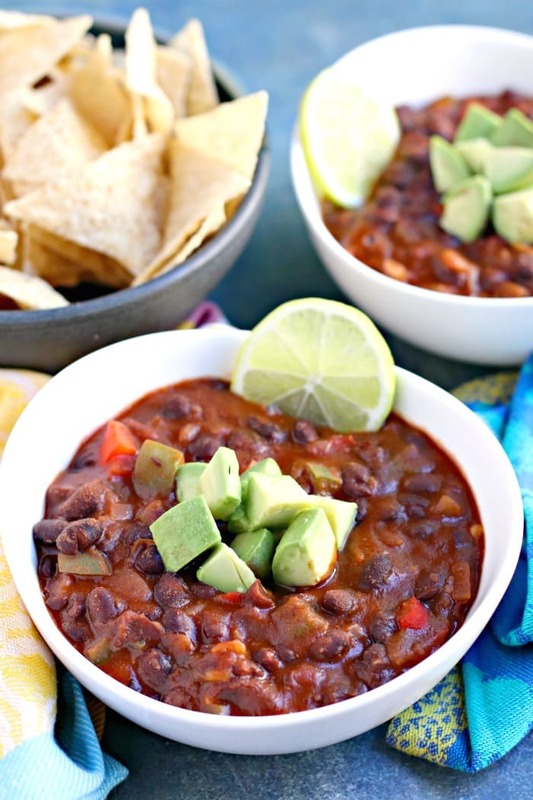 Easy Black Bean Chili is a one-pot meal that's ready in 30 minutes. It's full of flavor using common ingredients you may already have in your pantry. And this recipe is vegan and gluten-free. In a large pot or dutch oven, heat the olive oil over medium heat. Add the onion and saute about 5 minutes until soft and slightly translucent. Then add the garlic and saute about 30 seconds. Next add the bell peppers and saute about 2 minutes. Then add the tomato sauce, black beans with the reserved liquid, green chilies, cumin, chili powder, and oregano to the pot. Stir the ingredients to combine, then simmer 10 minutes, stirring occasionally, until heated through. Add a squeeze of lime juice and salt, to taste. Ladle the chili into bowls. Serve with lime wedges, diced avocado, and tortilla chips, if desired. When draining the canned black beans, reserve 1/2 cup of the liquid from the cans. Do not rinse the beans. I was excited about this recipe until I saw the 1200+ mg. Sodium. Amy! What were you thinking! Change tomato sauce to low – or no – sodium, and do the same with the beans. I don’t know about the chilis. Perhaps they, too, come in low or no sodium choices, though I kind of doubt it. But my suggestions should help lower the sodium a lot. Thank you for the feedback. Low-sodium options are always a great idea.